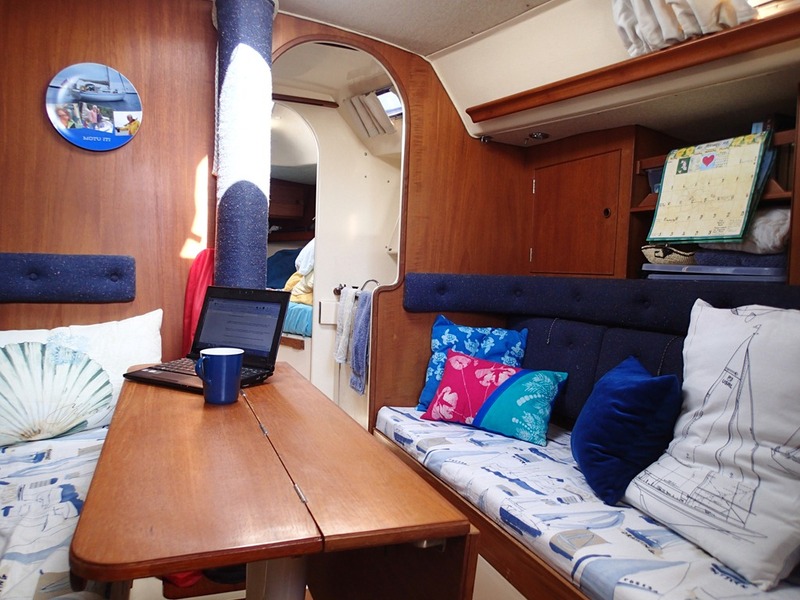 Since we are living on our boat, we want it to be comfortable and – well – livable. One way to do that is to make the inside of the boat look like a place you’d like to spend time and another is to make sure there is space to do what you enjoy doing. Don’t think of it as “interior décor,” which is unseemly for manly, salty sailors. Think about it as liking what you see when you go below in your boat. And keep in mind that every boat already has some sort of interior décor. 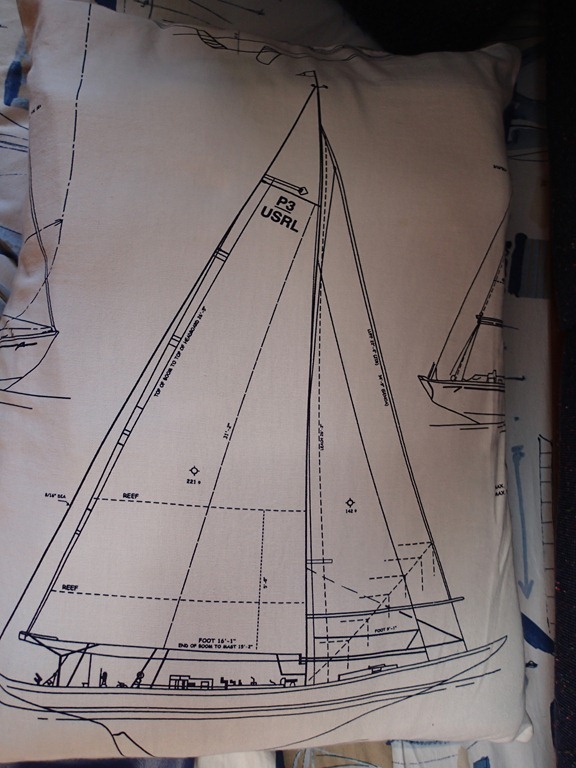 An older, used boat, (which is what we’ve always had), is probably going to have upholstery from the 1970’s or 1980’s – and not in a good way. It will be bland and boring, gross and disgusting, weirdly retro and hopelessly ugly, or all of the above. If it’s old enough, like our 1957 Rhodes Bounty, it’s vintage and classic. But those in between years were pretty awful. And you have to be sure that what’s on the boat will survive the trip. All parts of a boat really take a beating from cruising. 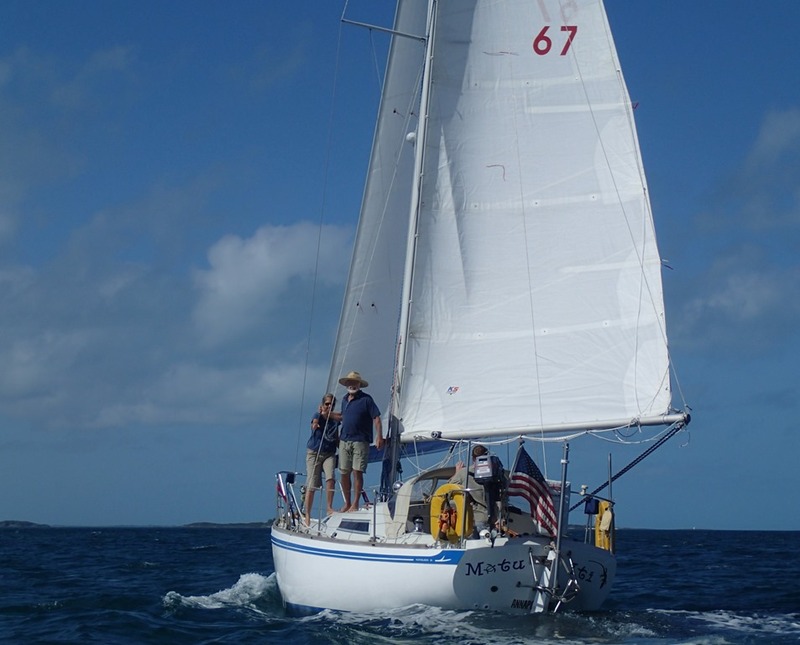 Face it, boats are made to be sailed a few times a year, not lived in 24/7. A boat’s interior décor is created mostly through its cabinetry – typically wood; and its upholstery – often bland and neutral. In a home, these would be your floor coverings, walls and furniture. Motu Iti came with beautiful wooden cabinetry and a blue tweedy fabric upholstery . We love the wood and blue is my favorite color, as will be obvious, below. Both happened to be in very good condition. That’s lucky for us because varnishing is so time-consuming and re-upholstering can be quite expensive even if you do the sewing yourself. But we still needed to update and brighten. 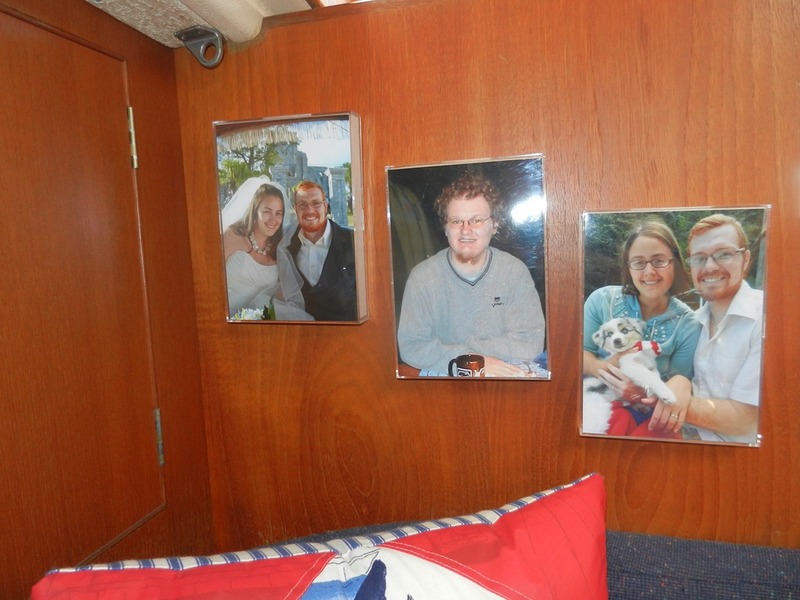 Here are some things I did to make the interior of the boat more livable and inviting. 1. Brightened it up with fabrics we like. 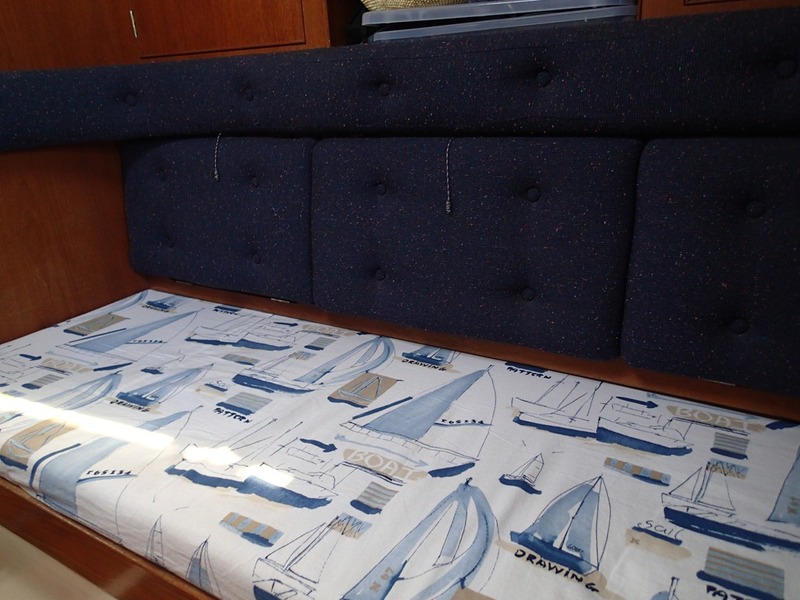 I made covers for the bottoms of the main cabin berths with an upholstery fabric in a nautical design that coordinates, colorwise, with the existing cushions. The covers will lengthen the life of the real upholstery, and are easily removable (sort of like fitted sheets) and very washable, either by laundering or spot cleaning. This fabric is actually what we have on a favorite sofa at home, only in a different color, so it is very familiar and comfortable for us. I also made accent pillows. 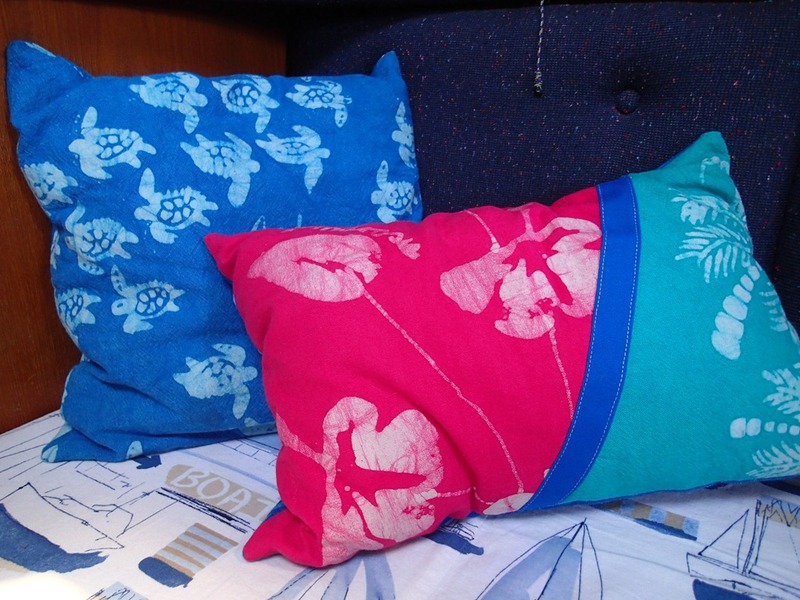 This is Androsia batik fabric which is made here in the Bahamas on the island of Andros. The gorgeous, bright colors are just plain fun. And they make the main cabin seating extra comfortable. This pillow stows blankets we are not using. 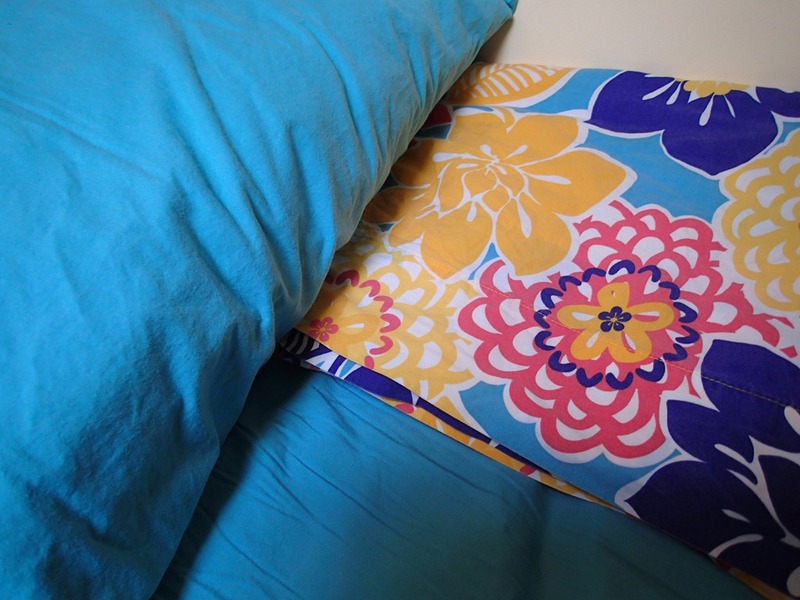 Instead of a pillow form inside, it contains two blankets. By not being squishy, it’s very supportive. 2. Put up family pictures to keep our loved ones close. These lightweight acrylic frames are attached to the bulkhead with self-adhesive velcro (Because putting holes in the beautiful wood of the bulkhead is a serious no-no). 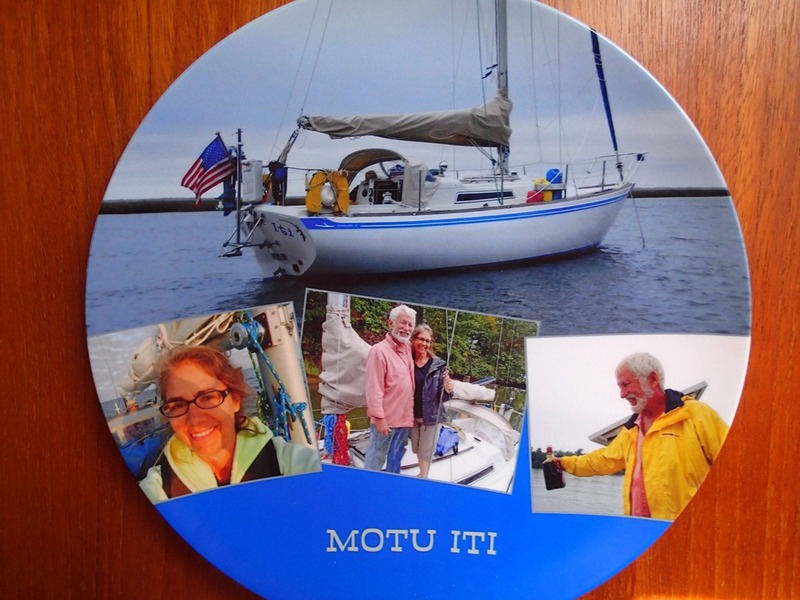 And here is a gorgeous plate our daughter made us using photos from this blog. It is also attached with self-adhesive velcro to what was, before, a very bare wooden bulkhead. 3. Added sheets and towels in fun colors and patterns. When you’re spending time in a laundromat, it’s nice to be folding sheets and towels that make you smile. 4. Outfitted my kitchen/galley with pots and pans, bowls, utensils and dishes that would make me happy and make cooking easier and more fun. If you have the time and budget, this is a great way to make a boat feel like home. 5. Added rugs. Small rugs (18” x 24”) – actually foam-backed bath mats – are at the bottom of the companionway steps. 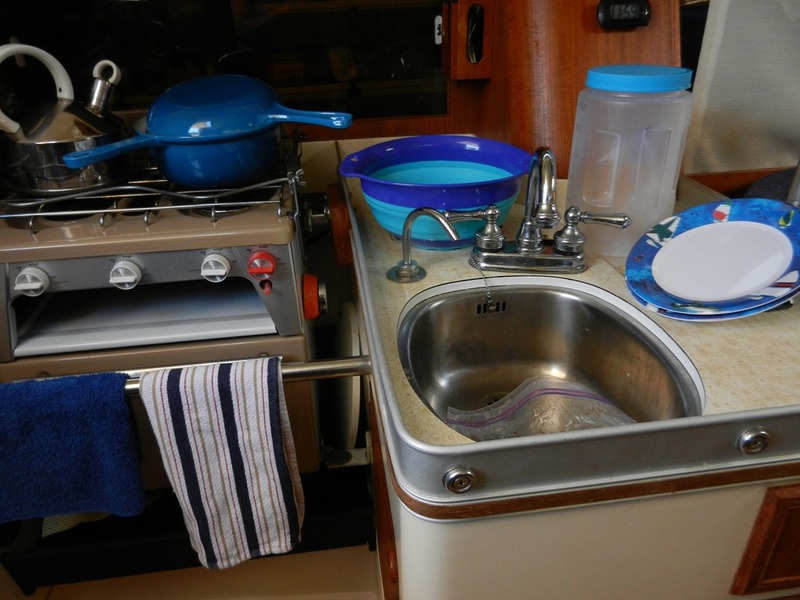 They are easy on the feet and very practical: they pick up little bits of stuff that gets tracked down into the boat and keep it out of the bunks. They are easily laundered or can be just brushed off (i.e., you don’t have to pay to wash and dry them). 6. Personal space: We re-purposed the quarterberth as Goldwin’s “man cave,” to store his tools, materials and special projects. My special storage areas, cabinets behind the main cabin cushions, are for my knitting and sewing supplies, and writing and camera gear. It’s not big, but it’s very livable. “Cozy” would be the word if it were a house. We like Motu Iti a lot. Which is good because when you’re living in approximately 200 sq. ft. of space, it’s nice to really like it. I enjoyed reading your blog and watching the video of your how you made your floating home so attractive. Love the decor, and all the colors. I copied some of your recipes from the last blog to make for our company next week. Wonderful post; so interesting! And so beautiful…but of course it would be with you doing it! I love the idea of pillows that hold extra blankets. Love your kitchen too. Amazing how few items you can really live with and do just fine. What do you miss the most in the kitchen? Good question. I miss more counterspace, big double sinks and hot running water. Your mother must be proud of your crafty skills and those you passed on to Amelia. Miss you.